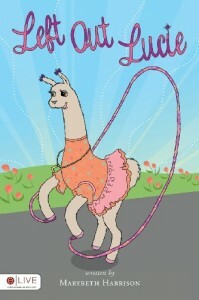 Lucie the llama has an experience all too familiar to so many kids. She is always chosen last for the kickball team. Ouch! She doesn’t even like kickball. The moment Lucie discovers what she is good at, she feels transformed. No need to feel left out anymore. The rhyming text is simple enough for early readers. For those who aren’t reading yet, or who benefit from practicing their listening skills, an audio book download is included with every book. Of course I always love an inspiring message. What I love even more is that the author takes Lucie’s message on the road. With a fun mix of singing, rhyming and learning, students in her local New Jersey schools learn that everyone is good at something. Through Harrison’s character education program children discuss rules, respect, problem- solving and perseverance, all topics found within the pages of Left Out Lucie. I would say that my favorite part of Lucie’s message is that she practiced everyday and found something that she liked to do. When I present to the kids I always give them an opportunity to share what they like to do (soccer, gymnastics, reading, etc…) and we discuss how important it is to practice. I also tell them that everyone is good at SOMETHING! I love the rhyming aspect of my book and I also enjoy the fact that the characters are animals. I think the story is relatable for anyone as we all can remember a time when we may have been “left out” at one time or another. Lucie solves her problem and is able to share her talent with kids on the playground. Hopefully, Lucie shares a positive message to anyone who hears her story. Please check out all of the great stuff happening over at www.marybethwritesbooks.com, where Left Out Lucie is more than a book. It’s a movement!